Heating and electricity cost were extremely high for a flat of 80m2. Also because we turned heating off when we went skiing. More transparency about these costs in the add would have been nice. thanks for being my host in my chalet, I'm happy you spent a nice holiday in my house and that you liked it. About personal consumptions, I have to specify that Heating costs (as explained in my welcome email) are included and well described in the contract terms that you have accepted when booked and are still advertised in the chalet informations regarding the security deposit and consumptions. However, the custodian was always at your disposal for any needs and to show you the arrival and departure reading from the central counters. Thanks again and I hope to see you soon in my chalet in Cortina, the Pearl of Dolomites. We've arrived in group of 6. 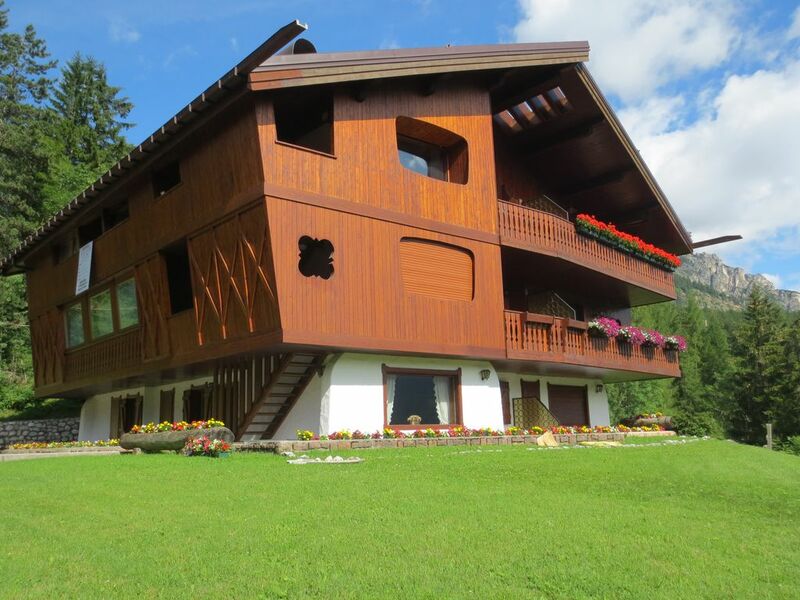 The apartament is wonderful, bright and clean with a gorgeous view on the Dolomites peaks. The kitchen was fully equipped and very functional. The living room was big and comfortable. The location is really near the center and it is at the beginning of mountain trail and in a beautiful surrounding so I was more than happy with it. It is worth to mention huge garage under the house which can easily accommodate every car. In summary. One of the best placed I’ve stayed at a reasonable price. I recommend it to everyone visiting Cortina. If we decide to have another visit in Dolomites for sure this will be the place where we will stay. Thanks a lot for being my guest. I really hope to see you soon in my chalet. La casa e' calda, accogliente, pulita e la vista indimenticabile. Carlotta e' molto gentile ed e' stato facile chiarire le condizioni del soggiorno. Spese contenute e massima dispobibilità del proprietario. Saremmo molto felici di tornare al piu' presto. Siete stati degli ospiti meravigliosi. Spero di riavervi presto nel mio chalet. Che dire....residenza meravigliosa, piena di fascino e confort; proprietari squisiti e sempre disponibili; box e posto auto x due auto (che chi tiene ai propri giocattoloni è un plus imprescindibile).....quasi non riesco a descrivere la soddisfazione di aver scelto questa location, che di sicura sarà nostra futura meta (invernale e probabilmente estiva). Abbiamo alloggiato in 4 adulti; due bambini e 1 cane ed è stato memorabile. La parte esterna con tutto il parco è fantastica! Fondamentale con dei bambini piccoli...ma anche per adulti che non vanno in montagna solo per sciare. Un Grazie enorme ai proprietari. Location fantastica! Chalet accanto ad un magnifico prato e bosco di abeti e larici vicinissimo al centro di cortina (5 minuti s piedi veramente!) silenzioso e bellissimo tutto in legno, arredato con gusto e dotato di qualsiasi tipo di comfort, i terrazzi vivibili donano relax e atmosfera specie di sera, per noi che al ritorno dalle escursioni e, messe a nanna le bimbe, trovavamo in essi il giusto e meritato relax. Lo consigliamo vivamente e ci torneremo. Un grazie speciale ad Adriana sempre cortese e disponibile. Grazie mille, è stato veramente un mio piacere ospitarvi ! Grazie per essere stati degli ospiti gentili, curati e attenti alla mia casa! Allora a presto a Cortina! We have spent here a fantastic holiday with my wife and 2 kids + a friend. The appartment in the chalet is beautiful and confortable, decorated with very nice wood local furniture. It is ideally situated 5' walking from the center of Cortina, but in a very quiet area (perfect if you run the Lavaredo Ultratrail). Also there is something stunning that does not appear on the photo: the view! We had great moments at sunset looking at the mountains getting into dark. You can even see the Cinque Torri. Adriana was not here but the house keeper of the chalets was very helpful. Adriana is very responsive and even at distance make sure your stay is going as smooth as possible. We will come back for sure! Thank you Adriana for the unforgettable holiday in your chalet! I'm really glad you spent a nice holiday in my chalet and that your feelings are so exciting. You and your family have been a really gentle guests. Thanks for having care of my house and I hope to see you soon in chalet De Rozes. Kind regards. Five minutes walk downhill from the center of the village the chalet is very romantic and quiet, the panorama is dreamy, from terraces with sunrise and breathtaking sunsets. The house is comfortable and the decor is new and well cared for. Completely in the middle of the 5000 m² greenery wood is often visited by cerbiat. It is absolutely ideal with children in every season, in fact, without moving the car, you can take various walks and with the ski to the feet you arrive to the cable car of the Faloria thanks to the trail that connects the Faloria to the city center; on the same route, always with the skis at the feet, you come home directly. Alpine Skiing --- The downhill runs are currently 65 for 115 km total served by 38 cableway installations, of which 4 cable cars, over twenty chairlifts and a dozen ski lifts. With the exception of the Falzarego passage and Mietres chairlifts, the ski slopes of each ski area are linked to skiing at their feet. These are the ampezzani ski areas. Cross-country skiing --- The slopes are divided into paths of any degree of difficulty for 58 km overall. The center of reference of this discipline is represented by the Fiames sports center (48 km of pistes). The most experienced can get along the track, more technical and often frequented by national and international athletes, of the Passo Tre Croci (10 km). Snowboards --- 'Pocol' and 'Socrepes' are ideal for beginners, while those who want to measure their skilful ability and breathtaking descent can venture into the '5 Torri' or 'Faloria'. The Cortina Snowpark is located in the Tofana area, near Socrepes (San Zan track). The plant, served by a four-seater chair lift, is 500 meters long and is divided into two areas of varying difficulty: Easy Line for beginners and Medium Line for more experienced snowboarders. Ice skating --- The historic Olympic stadium can be used both in winter and summer with a chilled ice rink (30 x 60 m), bar service, skating runners, solarium and children's playground. Railways --- Over 22. Overall 15,560 meters between equipped paths and railways. Free climbing and rock gyms --- 6 tops over 3,000 m, 850 sport climbing routes, 1,000 classic and modern climbing routes. Mountain Bike --- 16 numbered and reported routes (2 easy, 4 medium difficulty, 10 difficult). 250 km in total. 5 Bike Service Centers across the country. Tennis --- Tennis Country Club Cortina (5 outdoor terraces in red ground one of which with night lighting). Apollonio Stadium (5 open fields and 1 covered field open all year). Other tennis facilities can be found at the Franceschi Park Hotel, the Sporting Hotel Villa Blu and the Golf Club Miramonti. Golf --- Cortina Golf (currently has 9 holes but aims to double its existing availability on an already completed project and thus to enter 18 holes in major international golf circuits). Golf Club Miramonti (6 holes). Tariffe scontate in relazione alla durata, Deposito cauzionale di 300 euro in estate e 500 euro in inverno, Caparra richiesta alla prenotazione, Consegna delle chiavi da parte del proprietario, Costi dei consumi utenze non inclusi (luce, riscaldamento, acqua, gas e pulizie finali). I periodi di Natale/Capodanno, Carnevale, Pasqua e Agosto/Ferragosto potrebbero essere soggetti a un sovrapprezzo, si prega di contattare il proprietario per maggiori informazioni. Rimborsi totali dell'intero canone di locazione solo in caso di disdetta comunicata entro 6 mesi dalla conferma. Altrimenti verrà comunque detratto come penale il pagamento dell'acconto versato. Sono invece valide le condizioni di assicurazioni previste in caso di viaggio e in caso di assicurazione privata europ assistance viaggiare sicuri.